National Archives (NARA) Releases Pentagon Papers! 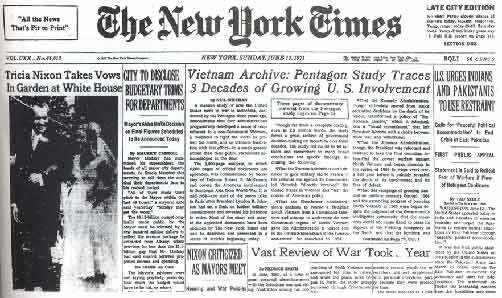 June 13, 1971: The New York Times begins to publish the Pentagon Papers. "After 40 Years, the Complete Pentagon Papers"
The Secret Briefs and the Secret Evidence. Supreme Court Briefs and Opinions. Richard Nixon, The Memoirs of Richard Nixon (New York: Grosset & Dunlap, 1978), pp. 508-515. Henry Kissinger, Years of Upheaval (Boston: Little, Brown and Company, 1982), pp. 115-118. H.R. Haldeman, The Haldeman Diaries (New York: Berkeley Books, 1995), pp. 363-371, 378. A great deal has been made of the "Eleven Words" during the final days before declassification of the Pentagon Papers. According to government officials, there is a passage of this length on one page that, forty years on, continued to pose the threat of grave damage to the national security of the United States and therefore required protection. This episode makes for an eerie parallel with U.S. Government arguments for secrecy in the original Pentagon Papers court case. In that venue, United States Solicitor General Erwin W. Griswold filed a Secret Brief describing, in effect, the Eleven Secrets that furnished reasons why the Pentagon Papers must be protected from public view. To that Mr. Griswold added a Special Appendix that piled on a number of additional "secrets" to increase the weight of the government's claim. Archive fellows performed a detailed analysis in which the relevant sections of the Papers were compared to the government's secrecy claims, and explored in terms of the actual history of the Vietnam war. In substance, this analysis demonstrated that claims to secrecy in the Pentagon Papers, in terms of the government's own arguments, were exceedingly thin even in 1971. Washington, DC, June 13, 2011 - The complete version of the Pentagon Papers released today by the National Archives and Records Administration (NARA) includes a substantial amount of information not previously published. Approximately 34% of the report is available for the first time, according to NARA. To mark today's public release, the National Security Archive here posts important background materials that users of the newly declassified portions of the Pentagon Papers—formally known as United States-Vietnam Relations, 1945-1967—will find helpful. The United States Government is declassifying and releasing the Pentagon Papers on the 40th anniversary of the leak of these same documents by then-RAND Corporation analyst Daniel Ellsberg, news of which first appeared in the New York Times of June 13, 1971. In actuality the collection is slightly more than 42 years old, having been turned over to the secretary of defense on January 15, 1969, although most of the work on the Papers had been completed at least a year earlier. The study United States-Vietnam Relations, 1945-1967 was assembled by a special task force within the Office of the Secretary of Defense. Robert S. McNamara ordered compilation of the study late in 1966, and it was assembled on a highly-classified basis by a group under DOD analyst Leslie H. Gelb, who was just 29 years old at the time. (Note 1) Some thirty-six analysts, including Ellsberg, worked on the report, which was intended to illuminate the sequence of steps through which the United States had mired itself in the Vietnam War, and the factors which prevented progress in that conflict and inhibited ending it by means of negotiation. Analysts individually compiled papers and assembled 15 collections of documents. In the end the main body of the study—the portion leaked—was arranged in 43 volumes comprising 4,000 pages of narrative and 3,000 pages of documents. The four “Diplomatic Volumes,” which were written (and released) separately, added another 800 pages. Continuing secrecy and arbitrary action have marked the long march to the opening of the Pentagon Papers. U.S. Government directives on information classification have set standards for the maximum interval documents can be protected. Only exceptionally sensitive information is supposed to be protected beyond those periods. The Pentagon Papers ceased being sensitive in 1975, when the Vietnam War ended. Some would argue they ceased being sensitive almost four years earlier, when the leak occurred. The Pentagon Papers have nevertheless been kept secret far beyond any of the standards for information protection (The New York Times called the papers “one of the worst-kept secrets in history” (Note 2))—and despite the end of any sensitive national security interest in their continuing classification—at a daily cost to American taxpayers. Through all this time Americans could read most of the Pentagon Papers’ contents in any of several published editions of the leaked materials. Secrecy persisted in the face of numerous efforts over the years to open the materials. The federal bureaucracy was given multiple opportunities to declassify them on the basis of requests under the Freedom of Information Act (FOIA) and the separate system for Mandatory Declassification Review (MDR). The National Security Archive is aware of FOIA requests in both the 1980s and 1990s which somehow were “lost” in the bureaucracy—no doubt there were others. This researcher himself filed an MDR request for the Pentagon Papers early last decade. That request failed to move forward because the government itself had put the Pentagon Papers on the list of materials to be reviewed by an internal declassification initiative called the “Remote Access Capture” (RAC) program. The RAC review of the Pentagon Papers led to a dead end. The only declassification action taken on the Pentagon Papers over the four decades until today came on the four so-called Diplomatic Volumes, which were released in expurgated form in the mid-late 1970s to Morton Halperin, who had worked on the project in the Pentagon under McNamara, and later joined the ACLU. These volumes were published in 1983 in redacted form, with commentary, by Vietnam scholar George C. Herring. In 2003 the U.S. Government completely declassified the Diplomatic Volumes to the National Security Archive on the basis of an MDR request by this researcher. This record led to the irony that the Diplomatic Volumes—which Dr. Ellsberg had protected when leaking the bulk of the study—were in the public domain while the Pentagon Papers that were in the open due to the leak remained secret. Upon entering office, the Obama Administration encountered a backlog of over 400 million pages of still-secret documents that had also passed their reasonable expiration dates. Among other actions, it created the National Declassification Center to introduce uniformity into secrecy policy and issued orders that the backlog be eliminated. The release of the Pentagon Papers represents the most substantial achievement to date of the Obama Administration’s effort to reduce the mountain of no-longer useful secrets. The National Security Archive extends its appreciation to the National Archives and Records Administration (NARA) for this action. We look forward to the opening of the remainder of these materials and others as well. The full version of the Pentagon Papers contains a wealth of new material. Unlike the State Department’s Foreign Relations of the United States (FRUS) series (the official historical record of U.S. diplomacy), which has also covered this period in its published volumes, the Papers focus on specific, thematic subjects in considerable detail. Also distinct from FRUS, which is assembled by professional historians at least 30 years after the fact, the Pentagon Papers were compiled by defense analysts in the immediate aftermath of the events they cover, when developments were still fresh in their minds and they could put their hands on relevant material. 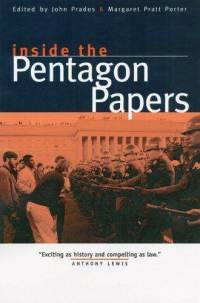 In comparison with the House Armed Services Committee (HASC) print of 1971, which until today was the only officially released version of the Pentagon Papers, the declassified volumes will illuminate findings of the Pentagon Papers analysts and data that have long been suppressed. To give just one example, the study contains a selection of data on the war in both North and South Vietnam covering the period of and immediately after the U.S. ground intervention (1965-1967), which is represented in the HASC edition simply by summary charts. The original study contains an estimated 2,000 pages of documents, many of them pertaining to U.S. strategy during the Eisenhower and Kennedy administrations. The HASC edition contains very few documents dated later than 1963, thus excluding almost all the Johnson evidence, and some Kennedy material. In addition, the HASC version of the Papers was heavily expurgated, in particular on such subjects as a coup against Ngo Dinh Diem, the Gulf of Tonkin incident, cross-border operations, Southeast Asia Treaty Organization matters, U.S. bombing policy, and some materials on U.S. training of the South Vietnamese military. Another important comparison is with the version of the Pentagon Papers that Daniel Ellsberg actually leaked, which obviously never passed through the hands of government censors. These were published as The Senator Gravel Edition: The Pentagon Papers (Boston: Beacon Press, 1971). Editors of the Gravel edition either lacked access to, did not have space for, or were not as interested in certain other material. The Gravel edition also lacks the statistical section mentioned above, plus it is much less ample for the early period in Vietnam, excluding documents for the Roosevelt and Truman administrations and the Geneva conference. In contrast to the HASC version, the Gravel edition contains many documents dated after 1963, but without an item-by-item juxtaposition it will be impossible to tell what is new and what is not. It is in fact possible that documents in the Gravel edition were extracted from the narrative of the original or from a different source altogether. Neither previously released version of the Papers includes the background papers written by project analysts. This very significant material will be entirely new. The Gravel edition also lacks the footnotes that were separately gathered, and of course both editions omit the Diplomatic Volumes. Again, careful dissection will be required to highlight other new advances in our knowledge. What Are We Posting Today? Our updated posting today consists of both audiotapes and documents that are central to the larger story of the Pentagon Papers. The Nixon administration sought to restrain the press from covering the substantive content of the Pentagon Papers. Here we post audiofiles and transcripts of the telephone conversations in which Mr. Nixon and his associates determined to seek that prior restraint. The resulting court cases against the New York Times and the Washington Post went to the Supreme Court. We are posting a set of the legal briefs that were filed with the Court along with the audiotape of the argument before the Supreme Court. The Government’s claims as to the damage to U.S. national security alleged to be caused by the revelation of the Pentagon Papers were presented in an affidavit from Solicitor General Erwin W. Griswold. We post that memorandum plus an analysis of the specific allegations written by Archive senior fellow John Prados. In addition, we post the declassified text of a little-known complement to the Pentagon Papers that was compiled at the Department of State. As a result of its participation in creating the Diplomatic Volumes of the Pentagon Papers, the State Department was aware of this secret Pentagon project. Secretary of State Dean Rusk took the opportunity to order a similar retrospective review of the handling of Vietnam intelligence by its Bureau of Intelligence and Research. This broad study had a stature similar to that of the Pentagon Papers and deserves to be examined alongside it. The State Department Papers never leaked and thus are hardly known. They will be completely new to most readers. 1. Gelb would go on to senior positions at the State and Defense departments and later become a Pulitzer-prize winning New York Times correspondent. 2. Michael Cooper and Sam Roberts, The New York Times, June 7, 2011.